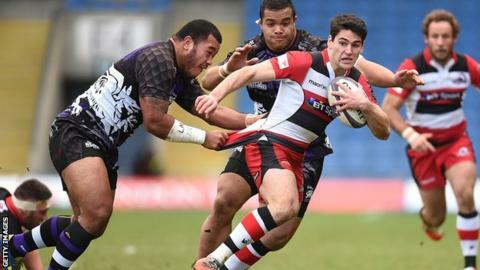 Edinburgh maintained their 100% record in European Challenge Cup pool four with victory at the Kassam Stadium. London Welsh had an early chance when Alan Awcock burst through the line, but a wild pass wasted the opportunity. The visitors led 9-3 at the break and Sam Hidalgo-Clyne soon stretched the lead with his fourth penalty. The decisive moment came when Jack Cuthbert fed wing Dougie Fife for the opening try and flanker Roddy Grant went over to seal the win. Having beaten London Welsh 25-13 at Murrayfield last weekend, Edinburgh made seven changes, with Greig Tonks and Hidalgo-Clyne forming a new half-back pairing. Exiles boss Justin Burnell changed two-thirds of his starting XV, but his side came under pressure with Edinburgh winning a five-metre scrum and Fife threatening the line before being forced into touch. After Hidalgo-Clyne's first successful kick, Chris Elder brought London Welsh level and they were given a further boost when Andries Strauss was sin-binned. However, they were unable to make the man extra count and then conceded the numerical advantage when Lachlan McCaffrey was shown a yellow card just before the interval. Hidalgo-Clyne made it 12-3 following the re-start when the home side were penalised for going over the top and, although Elder reduced the deficit moments later, Edinburgh showed some clinical finishing in the final 20 minutes. Fife's touchdown prompted London Welsh to send on Piri Weepu at fly-half, with Ollie Barkley switching to inside centre, but they were unable to pierce Edinburgh's defence and lost lock Dean Schofield to the sin-bin before Grant added the second try late on. Tonks added the conversion as the visitors made it four wins out of four. London Welsh: Kear; Elder, Awcock, May (capt), Scott; Barkley, Lewis; Aholelei, Morris, Vea; Schofield, Down; Browne, Kirwan, McCaffrey. Replacements: Rowley for Lewis (71), Cooper for Vea (69), Weepu for Schofield (71). Not used: Vella, Reeves, Corker, Pienaar, Reynolds. Edinburgh: Cuthbert; Fife, Scott, Strauss, Visser; Tonks, Hidalgo-Clyne; Sutherland, Cochrane, Andress; Bresler, Toolis; Leonardi, Grant, Coman (capt). Replacements: Heathcote for Strauss (71), Hart for Hidalgo-Clyne (73), Nel for Cochrane (71), McInally for Leonardi (50). Not used: Hilterbrand, Shiells, McKenzie, Beard.